You were robbed of life. Your spirit enriches ours. 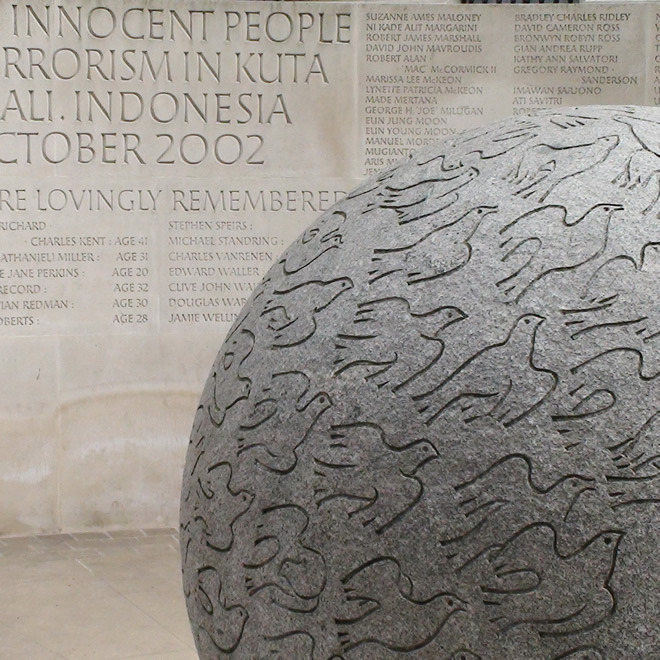 In memory of the 202 innocent people killed by an act of terrorism in Kuta on the island of Bali, Indonesia on the 12th of October 2002. 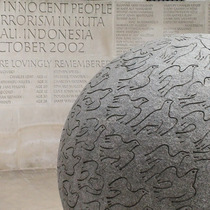 This memorial was unveiled by Their Royal Highnesses the Prince of Wales and the Duchess of Cornwall on 12th October 2006. Three of the non-British victims are given as "unknown" at "u" in the alphabetic list . This seems rather crass. It would have been more sensitive to finish the list with "and three unidentified people". Otherwise this is a fitting memorial. Bali is a holiday resort island in Indonesia. John Tweed was the sculptor of the statue.